Visit Palm Springs CA. Vacations here are sunny, with lots of outdoor activities for everyone. This California getaway is famous for its golf course and views from the Palm Springs tramway up to the top of the San Jacinto Mountains. Located in southern California about 2 hours drive from San Diego California and Los Angeles (including Hollywood and Disneyland, a Palm Springs weekend is a popular So Cal getaway. 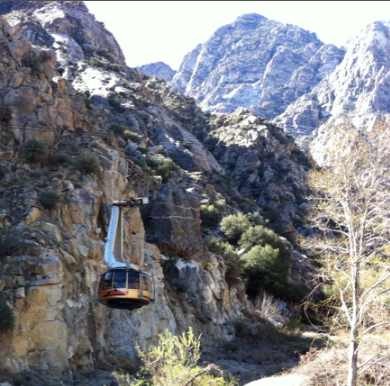 Palm Springs Tramway - Get a spectacular view of the area by riding the Palm Springs Aerial Tram up the San Jacinto Mountains. After your 10 minute 2.5 mile ride, you will be rewarded with a wonderful view at the top 8,516 feet (2596 meters) elevation! Not for those with a fear of heights. Be sure to check the weather report at 760.325.1391 as it can be much cooler at the top of the mountain than in the desert below. Open all year for your Palm Springs CA vacations. For discount tickets for the Palm Springs tram see arestravel.com. Wet n' Wild Palm Springs Water Park - If you are visiting during the hot summer months, the kids will love a day at this Palm Springs water park (formerly Knotts Soak City). The water park is open starting weekends in March then most days in the summer through Labor Day weekend, and weekends in October. For more information on the Wet n' Wild Palm Springs Water Park see www.wetnwildpalmsprings.com. Palm Spring Golf - Palm Springs is home to dozens of golf courses, so if you are looking for a beautiful golf vacation in California, this is a great choice. Cabazon Outlet Palm Springs - About 12 miles from Palm Springs is the Palm Springs outlet shopping mall Desert Hills Premium Outlets located at 48400 Seminole Drive, Cabazon, CA 92230. The Cabazon Outlet Palm Springs offer 130 premium outlet stores for your Palm Springs shopping spree. For more information about the Palm Springs outlet mall call (951) 849-6641. Palm Springs Shopping - If you prefer to stay in Palm Springs, nice shopping is available in the downtown area along N. Palm Canyon Drive and Indian Canyon Drive. Palm Springs VillageFest - If your Palm Springs CA vacations include a stay on Thursday night, check out the palm Springs VillageFest along Palm Canyon drive. Enjoy handmade jewelry, crafts, art, fresh fruit and veggies, and lots of food and entertainment. Hiking - Desert hiking is a great experience. We enjoyed hiking at the Thousand Palms in Coachella Preserve near Palm Desert. There are a variety of hikes from beginner to advanced. Palm Springs Things to Do - For additional Palm Springs activities and things to do, we suggest you stop by the Visitors Center on your way into town. They can provide you with Palm Springs maps, suggested hiking trails, and helpful suggestions for your best Palm Springs CA vacations. The visitor center is located at 2901 N Palm Canyon Drive, Palm Springs, California 92262, or call phone number 800.347-7746. 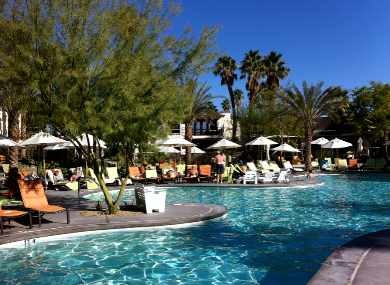 There are many Palm Springs hotels and resorts for every budget, so it is difficult to suggest just one. We recently spent a weekend at the Riviera Hotel Palm Springs Resort, and didn't want to leave. The room was spacious and comfortable, the pools were awesome. We ordered drinks and snacks at the poolside bar. For dinner, we went to their Circa59 Restaurant and had outstanding dinners - Roquefort crusted steak and seared Ahi tuna. For breakfast we had the "Old Faithful" traditional Eggs Benedict. They do offer a nice breakfast buffet on weekends too. Our compliments to the chef! The Riviera Hotel Palm Springs Resort was a perfect place for our relaxing Palm Springs vacation. If you want to be where the action is, you might choose a hotel a few miles down in the heart of the shopping area. was another nice stay. We got a free night at this Category 5 hotel. May we suggest you skip the bistro but for a great Italian dinner try Mimmo's Italian Restaurant and Bar in Palm Desert. The best Palm Springs CA vacations are from October to May, since this is the California desert. Our visit in early March was perfect, with high temperature around 80 degrees F (27 degrees C). 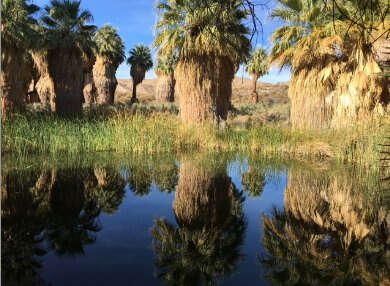 During the summer months of June, July, August and September, the weather in Palm Spring CA is hot, with average high temperature over 100 degrees F (38 degrees C). Here is a link to a good website for the weather in Palm Springs CA, as you will want to check out the Palm Springs weather forecast so you pack the right clothes! And don't forget, if you take the Palm Springs tramway, the temperature may be 20 - 30 degrees cooler at the top. Where is Palm Springs? Palm Springs is located in the California desert, about 2 hours drive east of Los Angeles area and 2 hours northeast of San Diego Calif. Plan a trip to Palm Springs CA for a great weekend getaway.